Your mobile device makes the perfect eclipse tool kit. Apps for weather forecasting and traffic congestion can guide you to the right place to enjoy the spectacle. And the Solar Eclipse Timer app (inset right) acts as your personal eclipse expert, talking you through the key stages and reminding you what to look for. With the right apps installed, your smartphone or tablet can be a powerful tool for planning and enjoying the Great American Solar Eclipse. It can deliver forecasts of eclipse-spoiling cloud cover and navigate you to sunny skies, and capture images of the eclipse and your own excited reactions to the big event. It can even speak to you, telling you what to look for and when, when to remove filters and enjoy the spectacle of totality with your naked eyes, and when it's time to cover up again. In this edition of Mobile Astronomy, we'll cover which apps to download and how to make the most of this once-in-a-lifetime experience. 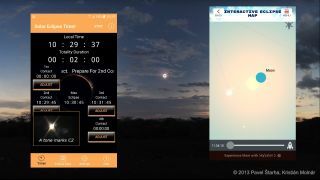 While all of the best paid sky-charting apps — such as SkySafari 5, Star Walk 2 and Stellarium Mobile — have that capability, the free Eclipse Safari app for iOS and Androidhas this and much more. I covered the app in detail here: How to Prep for Totality with New Eclipse Safari Mobile App. Eclipse Safari and other related apps use your device's GPS receiver to geolocate you on Earth. The amount of time the moon completely covers the sun during a solar eclipse is longest along the center of the 70-mile-wide (112 km) path of totality — roughly 2 minutes and 30 seconds for this eclipse. The length of totality drops as you move away from the center line, reducing gradually and then rapidly. An observer midway between the center line and the path edge will see only a 20-second reduction in totality's length. A site only 5 miles (8 kilometers) from the path edge still sees 50 percent of the maximum time, or 1 minute and 19 seconds. Within the outer few miles of the path of totality, the total eclipse duration drops dramatically — down to mere seconds. Eclipse Safari's Interactive Eclipse Map function indicates whether you are inside the path of totality. To be certain of seeing the sun's corona, observers located near the edge should consider moving deeper into the path, even by just a few miles. Cloudy skies are the enemy of eclipse chasers. Though you may catch a glimpse of the partially covered sun through thin clouds, totality will be completely spoiled by cloud cover. Therefore, it's important to pay close attention to the weather forecast for the hour when totality occurs at your viewing location. If there's a risk of clouds, including thunderstorms that may develop suddenly, you should be ready to relocate to areas with clear skies elsewhere along the eclipse path. Clear skies are essential to see the solar eclipse. The National Weather Service's forecasting website allows you to select a weather parameter, such as the percentage of cloud cover, shown here. Using the slider on the upper right, you can preview the forecast for Aug. 21 and make plans to be where the sun is shining. To see your local weather forecast, you can zoom in on the map. Depending on the traffic congestion in your area, you may want to start moving toward your viewing spot well ahead of the eclipse time. (Remember that totality occurs later as you move eastward along the path.) Allow plenty of time to find a site and set up in an unfamiliar town. Your device's stock navigation app will assist you in planning the route to your observing site and in finding options for relocating if necessary. Use the traffic layer to avoid congested routes; roads in the path of totality will be VERY busy on eclipse day. While logged into your Google account, use this link to call up the map 2017 Eclipse Path. Then, click the star icon to the right of the map title to add it to your own My Maps collection. For traffic, use this link to the Solar Eclipse 2017 Highway Traffic Map. This one includes a map legend. You can add and manage the maps from your computer, and they'll appear on your mobile device. Later, you can delete the map by visiting your Google account's My Maps page. For observers and tourists in rural or remote areas, internet coverage may be limited or unavailable. To be safe, download offline maps for your eclipse viewing site and for any places you might need to move to. B. Crystal generated this map of predicted traffic density along the Great American Solar Eclipse path. Based on census data, it can be used to plan driving routes on Aug. 21. Maps like this can be loaded into an Android navigation app via the My Maps section of your Google account. Eclipse watchers should try to find a location at least 5 miles (8 kilometers) inside the path. The length of totality drops dramatically near the two edges. Excitement for the eclipse really kicks into gear when the moon takes the first "bite" out of the sun — also known as "first contact." This phenomenon is visible everywhere the eclipse is observable, including the partial-eclipse regions throughout the northern U.S. and Canada, and the southern U.S. and Central America. Observers with filtered telescopes or binoculars who want to see the first contact under magnification will need to know where around the sun's disk to look for the encroaching moon, since it will be invisible until it "contacts" the sun. The first step is to know what time first contact happens. Eclipse Safari provides the time for your location and a View button to generate the simulated sky view as seen with naked eyes. On that screen, swipe to enlarge the view, and note the angle where the sun and the moon appear to touch. Because the moon is sliding along its orbit from west to east, the contact point will be somewhere along the sun's right edge. The Eclipse Safari app's interactive map allows you to determine the precise times of the partial or total eclipse. The "first contact" of the partial eclipse visible in Chicago will occur at 11:54:18 a.m. local time, with the moon first touching the sun at the upper right, as shown in the app's sky simulation tool. A filtered telescope may invert or flip the view. If you are viewing with eclipse glasses or binoculars, the geometry will be the same as in the app. However, you may not see the "bite" until it's large enough to notice without magnification. In a solar-filtered telescope, you can select an eyepiece that magnifies the sun's disk nicely. But remember, your scope's optics may invert and/or flip the view from what the app shows. Practice looking at something terrestrial ahead of time to check this. Then, account for any change when pointing the telescope for the eclipse. (Remember to ensure that the filters are securely in place!) When you're practicing, use the same combination of accessories (star diagonal, eyepiece, Barlow lens, etc.) that you'll use for the eclipse. The solar filter itself will not affect the orientation. Start watching a minute or two ahead of first-contact time. Perhaps a friend can watch the smartphone and call out the time. REMEMBER: During totality, when the sun's disk is completely covered by the moon, it is safe to view the eclipse with the naked eye. But skywatchers should NEVER look at a partial solar eclipse without proper eye protection. Looking directly at the sun, even when it is partially covered by the moon, can cause serious eye damage or blindness. You can read about other viewing options here. During a total solar eclipse, a lot of interesting phenomena are visible. Things happen quickly, and it's easy for first-timers to not know about them — or to forget to look for them. It's safe to remove eclipse glasses and view the total eclipse with naked eyes and unfiltered cameras and telescopes only while the moon completely covers the sun. And it's critically important to replace all protection before the moon moves off the sun again. You won't want to be looking at your phone during the total eclipse, but how will you know when to remove your glasses, and when to put them back on? Well, there's an app for that. Just in time for the Great American Solar Eclipse, seasoned eclipse chaser Gordon Telepun has released the unique Solar Eclipse Timer app for iOS and Android. Originally developed for PC, it announces out loud the stages of the eclipse, warns you when to remove and replace your eclipse glasses, and tells you what to watch for. It also features assistance for eclipse imagers. The Solar Eclipse Timer app for the Aug. 21 eclipse puts a seasoned eclipse expert in your pocket. Developed by veteran eclipse chaser Gordon Telepun, the app calculates timings at your location for the key stages of the eclipse. Then, using audible voice announcements, he counts down to each stage, reminds you to remove and replace eclipse glasses, and prompts you to observe the special phenomena solar eclipses bring. The app even lets you run simulated practice eclipses to get you ready. An extensive help page acts as a virtual eclipse coach. The app uses your device's GPS (geolocation) to determine your observing site, and then calculates the eclipse circumstances. During the eclipse, Telepun's voice announces out loud when events are about to occur, as well as when and where to look for eclipse phenomena, such as temperature drops, dimming of the sky, the arrival of the moon's shadow, and animals and birds preparing for bed. During the partial phase, he prompts you to capture images of the eclipsed sun that will form a pleasing sequence of 10 images. At second contact, the start of totality, he reminds you to remove your eclipse glasses and observe the spectacular diamond ring and Baily's beads effects, caused when sunlight peeks through low spots aroun. The app audibly counts down the seconds until totality and issues a loud tone at the correct moment. During totality, the spoken timer measures the time remaining. And at the end of totality, it alerts you to watch again for the ring and beads and to put your eclipse glasses and filters back on. The app includes sample images and text labels for each eclipse phase and phenomenon. It's just like having your own personal eclipse expert or coach in your ear! The eclipse rehearsal feature is especially good. A set of demo contact times can be loaded for you to hear and see what the app will do and say during the real eclipse. A second mode runs the simulated eclipse with an inset video showing a real eclipse. I found this very helpful. Another nice feature is the ability to manually adjust your location (in case of GPS inaccuracies) and the contact times (if your device's phone or network provider is slightly off). The app has a page with a detailed checklist for both visual and photographic observers, including what equipment to have on hand, reminders to charge your device and camera batteries, and how to configure your device to prevent sleep and switch off external notifications, such as texts and social media alerts. With a built-in help file, a comprehensive Solar Eclipse Timer website and a YouTube video library, this app is an essential tool for Aug. 21, 2017. It'll certainly be on my phone! After the eclipse, future editions of Mobile Astronomy will cover telescope remote control, how to measure the distances to the stars, how to re-create some famous astronomical discoveries, and more. In the meantime, I wish you sunny skies for eclipse day. Keep looking up!